Check out this incredible DIY steno machine with step-by-step instructions on how to build it, by the amazing Carl. It's called the Volksboard, and I love it. 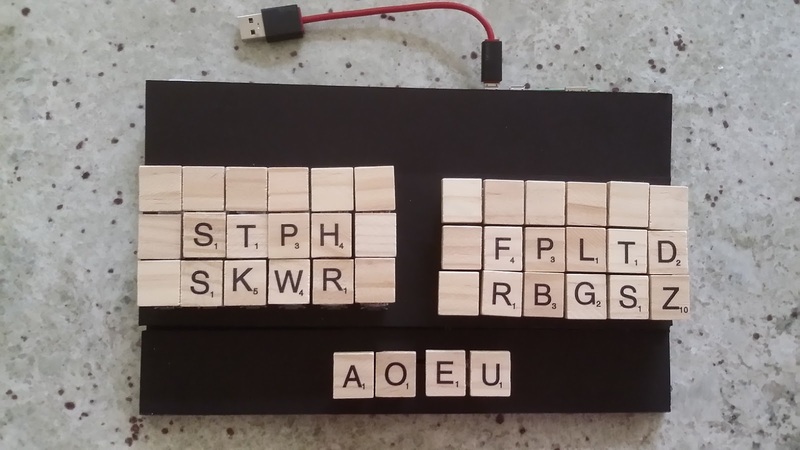 Scrabble tiles for steno keys! Ingenious! It's also wireless and uses WiFi with a Raspberry Pi Zero built into the board to connect to Plover. I really like this. This is a little bit beyond anything I've ever done for electronic shenanigans, but the guide makes me think I can do it. I can also mull adding a split angle to the two halves and even moving a few keys up or down vertically for better positioning. No more twisting my hand to reach the 9 or the key to the right of that for some briefs. I know the switches would feel harder than a steno machine, but how much harder? Also, wood keys on a steno machine seems like it would be AWESOME. Idk though. I think the Scrabble tiles are a fantastic idea. Thanks for featuring the Volksboard on the blog, Mirabai. I hadn't seen it before. I want to give credit to Robert Fontaine for the scrabble tiles idea a few months back. That really made the Volksboard a lot better and also easier to build. In the interest of further simplifying the build -- aiming for something that a school club or the like could build -- I'm planning the next one to get rid of separate keys for the number bar and the blank keys at the left and go with the idea that's been kicked around on the Discord board of just putting a # key to the right of the EU pair. The reduction in switch count will simplify the geometry getting rid of some wire crossings that currently have to be considered and just make about a third less work overall. I'll post a picture on Discord when it's done. About the switch feel -- these are Matias linear switches; they activate between 35g and 45g and full depression is about 50g. This is harder than ideal based on reports from people who've used switches with cut springs; but for beginners maybe not such a bad thing because, I conjecture, it somewhat reduces the number misstrokes from fingers that may brush against keys.